So what do we do all day here at The Willary? On days we have fittings I pack up the necessary fabric, samples, trims, sketches, paperwork, and notions and head to the Garment District to our sample shop. 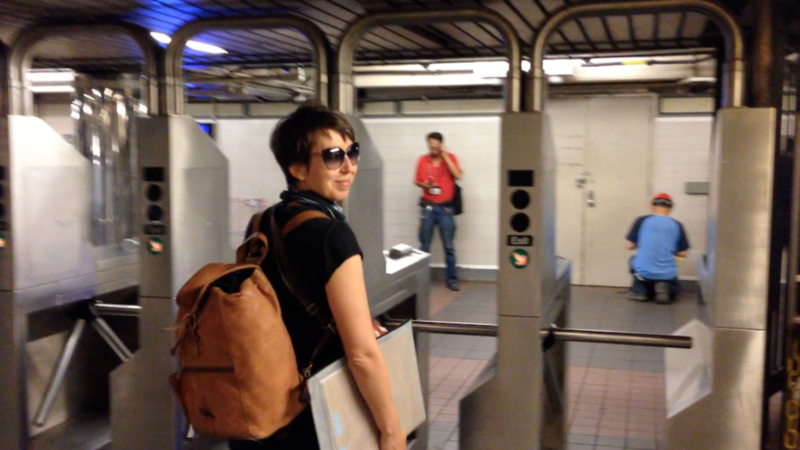 The only time the guys selling double decker bus tickets to Midtown tourists pitch me is when I make this trip–it's got to be the over-stuffed backpack and the purse sensibly worn across my chest. The Garment District is one of the reasons Chelsea and I uprooted from Chicago and moved to New York to start The Willary. In these early stages of development it's invaluable to have our sample shop a block away from the place we buy our interlining, which is just across the street from where we get our zippers cut, which is the same place we buy our thread–and all of this is just a 25 minute train ride from our office (which, let's be honest, is a desk in our living room). Obviously being close to everything saves time, but the real value is being near our product and the people helping us develop and ultimately manufacture it. Communication happens in real time, I can visit new vendors easily, we can get materials to our shops quickly, I can pop in to take a look at a garment if there's a question, and, when we move into manufacturing, I can visit our factories for quality control. I do the Garment District rounds about twice a week–one day I might hop on a double decker bus tour just to mix things up a bit.